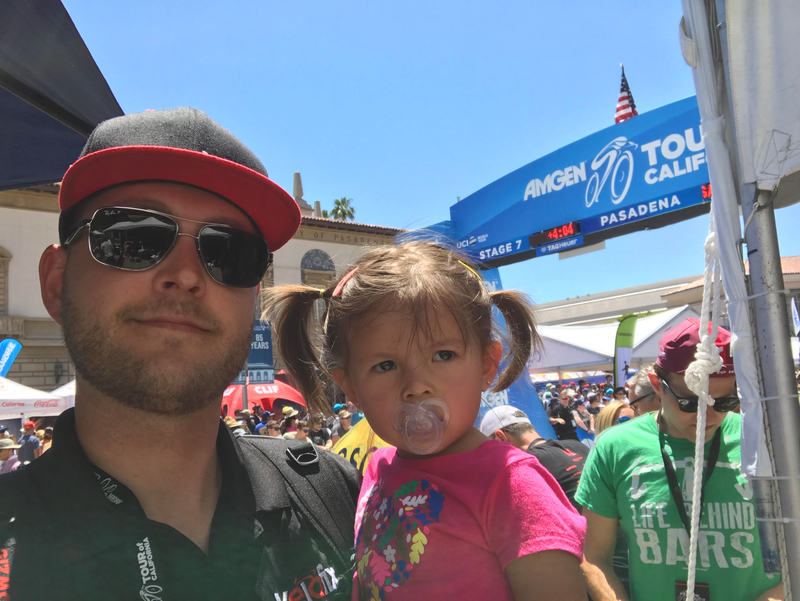 With 2017 being another fantastic year for the Tour of California, I wanted to take the time to reflect on my involvement with the race. Each year living in Santa Clarita I'm grateful to see at least one stage finish. This year was no different. The riders started their day in Santa Barbara and ended on Magic Mountain Road in Santa Clarita. The day of the Santa Clarita stage finish, Road Bike Action Magazine hosted a supported ride up Bouquet, to Spunky and back to the finish line down through San Fransquito Canyon Road. All and all there were a total of 100 riders. Just before the ride started, I decided to drop some race weight and head to the outhouse. 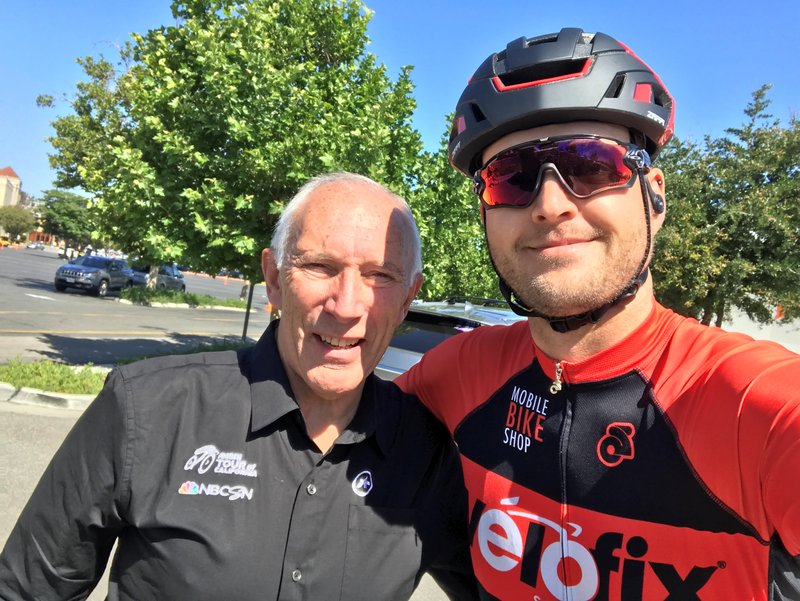 As soon as I arrived there, I was passed by Phil Liggett. I let Phil do his thing before the official meet and great. I'm sure he gets stopped a lot at races, but Phil took the time to chat and even discuss our similar roadID safety bracelets. Now on to the ride. The headwind didn't care which direction you were going. If you were travelling East, it was blowing hard from the East. You turn a bend and started to head West, The wind suddenly came at you from the West. It was a day where you buried your head and kept your legs spinning. Once back at the Finish Line, I was lucky enough to have entered the VIP viewing area. Needless to say this area is filled with free food and adult beverages. We watched as the break stick and came flying into the Finish Line. It was nice to see the underdog Team Rally take the win. While watching the Mount Baldy climb, which I climbed last month with the l'etape California, I knew exactly what the riders were in for. 78 miles, and 11,000 feet of climbing. 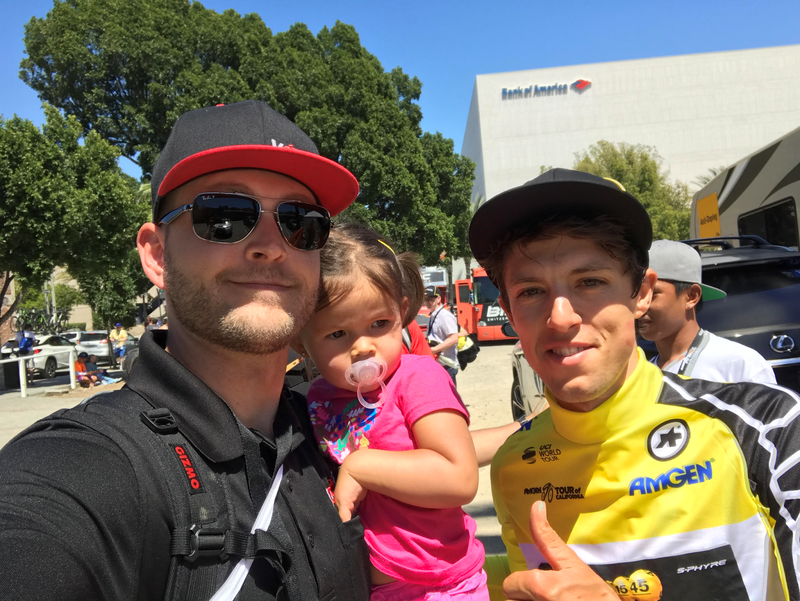 While keeping up with the live race stream, I was calling for George Bennett to take the overall tour win. He had been a very consistent rider and was always found upfront with the seasoned riders. Majka was holding strong until the end where Andrew Talansky took the victory. 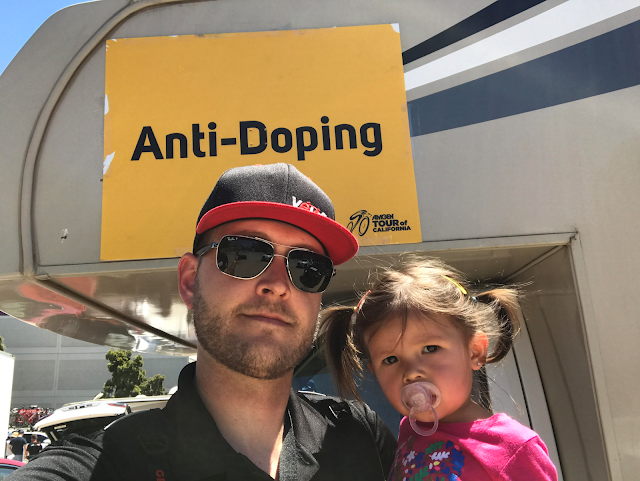 For the final stage in Pasadena, I went with my daughter and once again we found ourselves in the VIP viewing area. 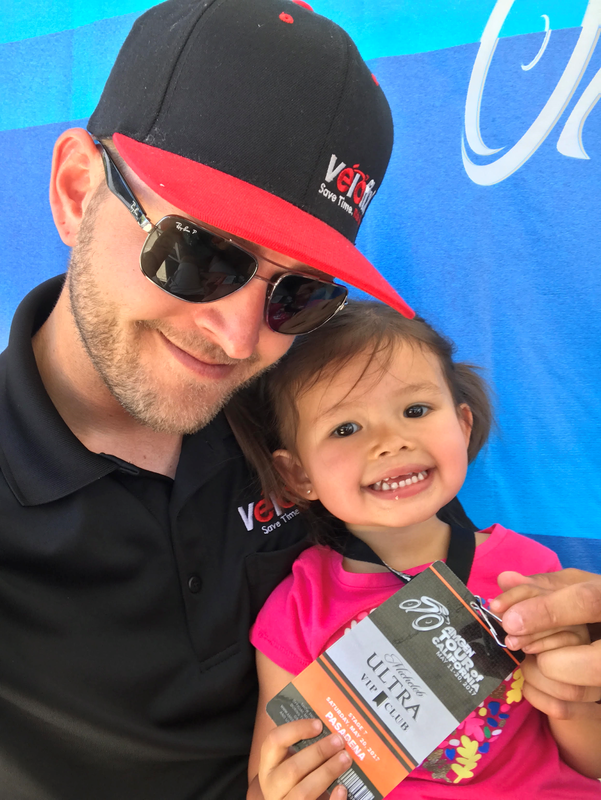 I think my daughter was more excited to visit vendors and receive free gifts and ring the cow bell than the actual race. Regardless, I'm grooming her to be a number 1 cycling fan. Team Rally Cycling grabbed the win on Stage 7 with Evan Huffman's second stage win of the 7 stage race. My Mt. Baldy predictions about George Bennett were true. The great thing about cycling is that you don't always have to be the fastest rider to win the tour, you just need to be consistent and lucky. George Bennett didn't have a stage win, but finished with an overall saddle time of 22h54m38s to take the Yellow Jersey for the 2017 Tour of California. I'm excited to see where Rally Cycling goes from here, and I know they can only continue to grow. Congrats to George Bennett.